I missed the album launch last month and I didn't get to Julija's DJazz gig on Saturday gone but I do, however, intend to catch her at The Globe on Sunday (June 10). 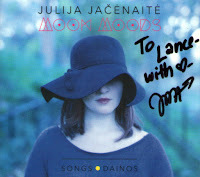 In the meantime, this album of Julija's originals will tide me over till then and, indeed, long after. Since I first heard JJ at the Jazz Café back in the Crombie days and more recently when she reappeared on the scene, I've been a fan of her delivery - emotional, sometimes dramatic, but always sung from the heart. Now I find she has those same qualities and more as a songwriter. The 12 originals are varied, melodic and, despite several of them being multi-lingual, very accessible. The actual tunes will, I'm sure, in years to come will be in the Great Lithuanian Songbook and although I don't understand the words I get the mood. Songs of happiness and pain, joy and sorrow, jazz at the core but not the whole. Apart from the vocals, several of the northeast's jazz elite are present amongst the above personnel. Alan Law, Steve Glendinning, Paul Grainger, Katy Trigger, Joel Brown and Paul Gowland are all featured at some point or other. Gowland has some whimsical moments responding to Julija's vocal on Jaukintojo Metal. Tops. If you don't believe me visit here or better still, catch her at The Globe on Sunday night. I'm not sure that I'm the right person to write this review as my words from a previous review of a live concert are quoted on the sleeve so I'm hardly likely to be hyper-critical even if the cover designer did misspell my name. What's in a name anyway? The odds against me correctly spelling the assortment of Lithuanian names among those below are pretty high! Julija Jačėnaitė (vocal) w. Kęstutis Pavalkis (piano); Driezhas (thunder & lightning); David French (shakers); Alan Law (piano); Steve Glendinning (guitar); Alexys Alfaro (guitar); Joel Brown (piano); Paul Grainger (bass); Paul Gowland (alto); Giedrę Kilčiauskienę (vocal); Vytis Smolskas (piano); Katy Trigger (bass); David Manasse (vocal).